You are here: Home / SQL Tutorial / SQL SUM(): How to use SQL SUM Function? 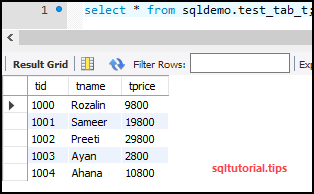 SQL SUM(): How to use SQL SUM Function? 3.1 What we learned in the SQL SUM() function? The SQL SUM() Function finds the sum of all the rows of a column. The data inside that column has to be summable. Let us take the following example into account. SQL SUM() Function: How to find SUM of a column value in a table? Here is the query to find the SUM of the tprice column. sql sum() function: how to find sum of all the values in a column? What we learned in the SQL SUM() function? We learned that the SQL SUM() function finds the summation of all the values in a column of a table. It takes column name or expression deducible to a summable value as an input parameter. SQL AVG(): How to use AVG() function? SQL INSERT INTO – How to INSERT data INTO database tables in SQL? Copyright 2018 - Content Must Not Be Produced Elsewhere.